At Wuho Gallery, Los Angeles, CA. Time for Arts Gowanus Open Studio! Saturday, October 20thor Sunday, October 21stfrom 12pm to 6pm. I am honored to be on the curator tour https://www.artsgowanus.org/gos-2018-selectedstudios/ composed by Robert Henry Contemporary. In the studio I will be showing some of the work that I produced for Russell Janis Gallery last spring for the Folly Cove Follow Up showhttps://russelljanis.com/folly-cove-follow-up/. There will be some sneak peeks of progress from my Winterthur Fellowship research and original drawings for work an upcoming project with A Public Space https://apublicspace.org/magazine/issue-27. More of my extreme embroidery work will be on view. There will be some prototypes and samples available for sale and, as always, I can speak to you about potential commissions while you are in the studio. so please come by! Annie is speaking at the Textile and Place Conference in Manchester, England on April 12-13th. 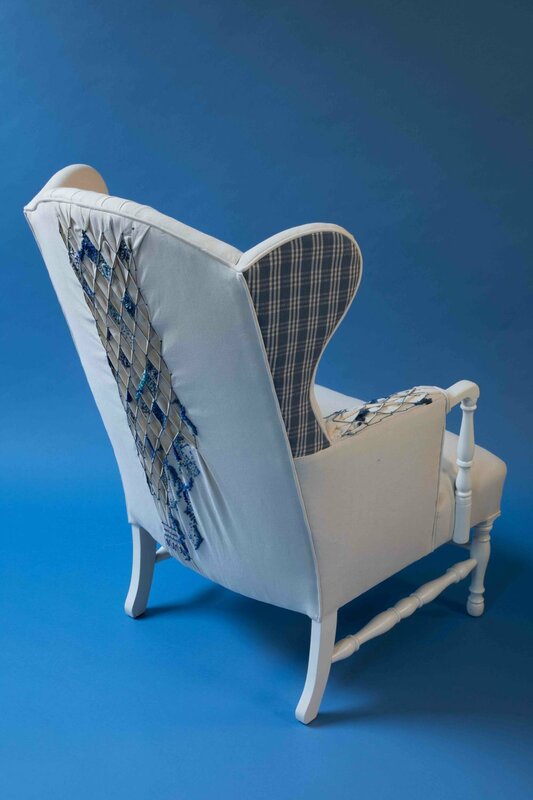 She will be taking about the The Smocking Chair that now is in the collection of The Tatter Textile Library. Well Autumn weather is not quite here but the energy and pace of September in New York City it certainly a thing.. This summer the studio was working at full tilt in Brooklyn as well at the Pearl Street house. Commissions for designers and private clients flew out out the door. A favorite commission is for the amazing Tatter Blue Library. At 95% finished, this homage to the stitching technique Smocking is really one my most complete pieces. 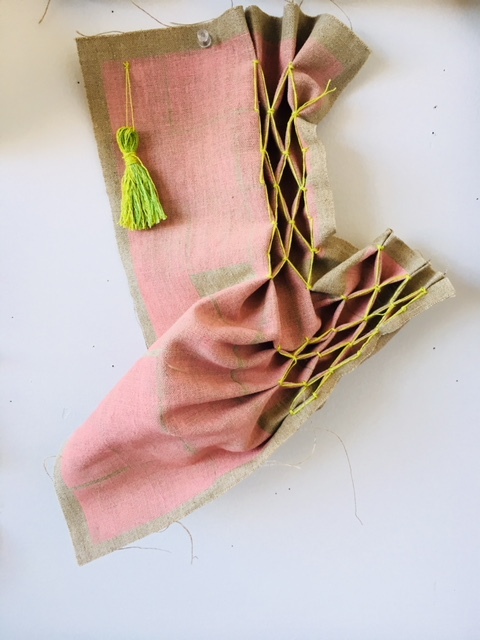 If you are curious about my process and the history and basic skill of Smocking join me at the Tatter Blue Library for a Modernist Smocking workshop! Tatter Blue Library is celebrating New York Textile Month by organizing Stitchember. There is also Coggan + Crawford work afoot. Brownstones and Brooklyn apartments, we always have fun. Very busy winter and now its spring! The end of last year after the election was a flurry of getting #wearyourprotest ready for benefits and auctions. One dress went to the GIVE BACK HOLIDAY MARKET sponsored by the amazing Textile Arts Center community. And another dress was featured in the wonderful show Unbroken organized artist Spencer Morela, Megan Piontkowski and Traci Talasco to benefit the ACLU. Watch this space for more interaction of the #wearyourprotest dress-many more dresses to come throughout the year. In March I presented the Knitted Rooms of Pratt students in Chicago at the IDEA conference. Adjunct Assistant Professor Annie Coggan presented her paper, “Knitted Rooms,” during the topic session “Design/Build.” The “Knitted Rooms” were full-scale installations designed by Pratt interior design graduate students and fabricated by machines at Pratt’s Brooklyn Fashion + Design Accelerator (BF+DA). And this next week I will be in LA participating in the unmentionables symposium where I will speak about paper mache civil war battle fields, imaginary 18th century families and the power of postcards. If your in LA come on by! This summer in the heat of the my obsession with election polls brought about my greatest fear. That a conservative government would interfere with our First Amendment rights as stated: I) to the United States Constitution prohibits the making of any law respecting an establishment of religion, ensuring that there is no prohibition on the free exercise of religion, abridging the freedom of speech, infringing on the freedom of the press, interfering with the right to peaceably assemble, or prohibiting the petitioning for a governmental redress of grievances. In reaction to this fear I have begun a series of embroidered dresses that illustrate the history of protest. My first dress was a depiction of Martin Luther Kings March on Selma, the next dress I made was depicting Grandi's Salt March. I have recently completed a depiction of the Freedom Riders protest in 1961. I feel that stitching these acts of voice and intention will bring me to a greater understanding of what is at stake in out country today. Democracy is fragile. October 15-16th is the beloved Gowanus Open Studios. Caleb and I, along with our studio mate Spring Hofeldt will be opening our studio during this great community event. I’ll have some new textile work to show and it’s always a great time to book me for commissions! I am also included in the group show at the Sweet Lorraine Gallery, entitled Stuff(ed). This is a highlight of my year, it's great to get feedback from the community as well as see what everyone else is up to! See more in this link: https://www.artsicle.com/communities/gowanus-open-studios and a press release for the Stuff(ed) show curated by Katherine Keltner. My studio address is 183 Lorraine St., Suite 2 (third floor). Hours are 12-6 Saturday and Sunday. If you haven't been by, exciting ideas abound at Chairs and Building these next few weeks. I asked twenty of my favorite draftspeople, artists and designers that have a practice of drawing a few questions about their practice and how they see drawing as a medium today. The likes of Perry Kulper and Richard Taransky have already weighted in. Stay turned for Sara Jones, Benjamin Marcus, Caleb Crawford and more. I had the great pleasure of writing the forward to the exhibition catalog for Rebecca Niederlander' s new show At Rio Hondo College. See the essay below and check out the evolution of the exhibition on Facebook. Rebecca Niederlander: A Field of Secrets. The practice of art criticism is rarely orchestrated 3,000 miles away and researched via a Facebook page…but even the act of art criticism can be transformed by the work of Rebecca Niederlander. Part mad scientist, part fairy godmother, part intellectual cheerleader, Niederlander transcends art practice. Her ability to engage at a number of community levels is extraordinary. Niederlander has contemplated the demography of Rio Hondo College and suspects there are many secrets, wishes, and aspirations that come out of the people there. Niederlander would like to honor this activity of secrets. Starting in late September she began the process of writing and urging the college community to write down their secrets on a white piece of paper in the Rio Hondo College Art Gallery. Each secret is then to be folded into a ritualistic origami balloon box that Niederlander has instructed the community on how to make through her presence in the gallery and through the duration of the exhibition. Niederlander’s choice of materials and her attitude toward materials are what most intrigues me. In her earlier work she has interrogated common electrical wire, colored Xerox paper, and vinyl signage paper. This proletariat, hardware store - or better yet office supply store aesthetic - is a practice in itself, but how Niederlander manifests it is remarkable. As if in the hands of Glenda the Good Witch these materials evolve into sparkling and ephemeral devices to protect your dreams and secrets. The schoolyard task of an origami folding project is now the mechanism of social commentary and beauty. This is a rare combination. The materials speak to democracy and community practice that transforms the banal to a pretty, Narnia-like world of folding forms and color. The effect is as powerful as the multiples of Eva Hesse and more dynamic and hopeful than an Ai Wei Wei protest piece. Another reading of Niederlander’s choice of materials is a feminist one. She has shunned the LA art tradition of anti-beauty, and the high gloss finish of hyper space to investigate how non-artist women make; its the after school projects and the handmade Halloween costumes that bring the artist parent to life. Niederlander’s preoccupation with family as a touchstone of creative practice dually informs her making activity. Whether her palette is a palette of a ‘tween girl or of a mature woman, in her hands the idea of consumeristic crafts are transformed into a rigorous investigation of space and community self-knowledge. Niederlander’s intent in her practice is to create space that is in the service of the community. In her We are Stardust. We are Golden. And we have to find our way back to the Garden, 2013, she investigated the demise of the community poppy bloom, and how due to climate change this event is to be mourned or reinvented. At Rio Hondo College Niederlander makes two spaces: one for the hive-like activity of many people writing the secrets down and manifesting the secrets box, and another where the gallery is empty and the boxes are delicately growing into a field of secrets. Without even being there, I can hear the installation with the rustle of the paper being folded and the silence of the boxes after a group has completed the ritual. The secrets of Rio Hondo are transmitted through the magic of Niederlander’s hands. New exciting posts on historic structures, place making and the spatializing history on Chairs and Buildings this month. So far an article from William Riehm, a tour of Mary Custis Lee's Arlington and a piece by Alexa Griffith Winton. Here is some new work from this summer. Brooklyn Buttons will be available at the Gowanus Art Open Studio Event in October so stay tuned! Don't forget to take a look at my most recent book review from e-Oculus and the Center of Architecture's Book Talk series. Hilary Brown's book is filled with provocative and challenging information. AnnieCoggan.com assembles twenty years of thinking, drawing and making. I have always maintained a parallel practice of furniture inquiry, historical research, “roommaking" and writing along with my work at Coggan + Crawford. I am thrilled that through the careful and persistent guidance of Sara Jones and Andrea Wenglowskyj’s Kind Aesthetic that all that this work now has a home. Please contact me if you have any queries, questions or insights. I hope you enjoy this aspect of my imagination.